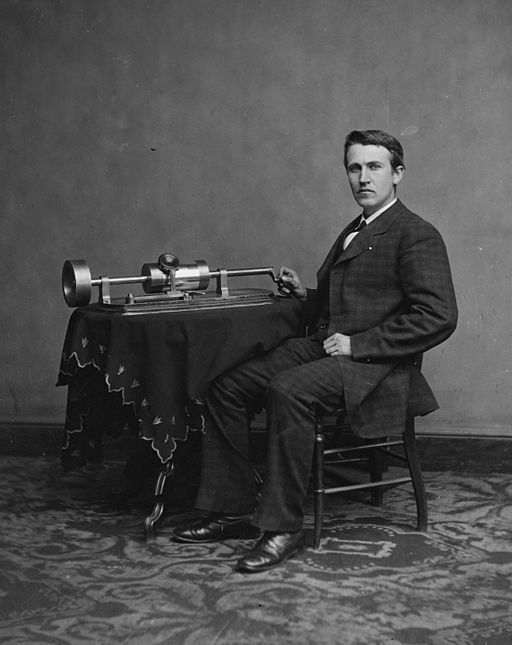 Thomas Alva Edison was born on 11th February 1847 in Milan, Ohio. He was arguably the greatest inventive genius of all time, with more than 1,000 United States patents to his name, but he was relatively modest about his achievements, once stating that: “Genius is one percent inspiration and ninety-nine percent perspiration”. At the heart of his work was the desire to create innovations that were of practical value in making peoples’ lives more productive and enjoyable. He said that he never wasted his time working on things that people would not want to buy. He also stated that many of his inventions were not original in concept, but he took the concept forward so that it became a reality. The invention for which he is best remembered, namely the electric light bulb, was a case in point. The idea of heating platinum strips to incandescence by applying an electric current had been formulated in 1801 by the British scientist Sir Humphrey Davy. However, Edison turned this into a practical proposition, after considerable trial and error, 78 years later. Edison’s first invention was an electric machine for recording votes, although this was rejected by the government of Massachusetts who realised that it would no longer be possible to rig votes if such a device became commonplace. Later inventions included a dictaphone, a mimeograph and a practical electric storage battery. However, the “big three” inventions were undoubtedly the electric light bulb as mentioned above, the phonograph, and the “kinetiscope” which was the earliest device for viewing silent films although it did not project an image. Edison lived to the age of 84, continuing to apply for patents until shortly before his death in October 1931.